1918 centennial plaques were distributed to owners on Sunday, May 6. The afternoon also featured the presentation of Preservation Awards to owners, architects and contractors of three exceptional projects. In addition, we also celebrated the 100th anniversary of the Palo Alto High School campus and the WWI Julia Morgan Hostess House (MacArthur Park Restaurant). Brass plaques were first awarded by the Palo Alto Historic Resources Board. 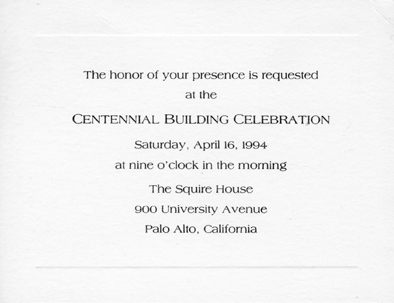 Owners of homes built in 1894 or earlier were presented with plaques on April 16, 1994 at a centennial celebration held in the front garden of the 1904 Squire House (900 University Avenue). At that time, 36 houses were listed on the Centennial Buildings Tour published by the Historic Resources Board and co-sponsored by PAST. Of the 36 houses on the tour, only one, the Juana Briones house, has been demolished. In 1996, Palo Alto Stanford Heritage (PAST) decided to carry on the tradition of recognition by honoring properties built in 1895 and 1896 and to present the first Preservation Awards. It has since become an annual event to present preservation awards and plaques during National Preservation Month. The theme for 2011 was Celebrating Palo Alto's and Stanford's Treasures. If your house is approaching its centennial, now is the time to let us know! Research on verifying construction/occupancy dates takes time, so please let us know so we can add your address to our list. As you will discover, many of these structures are no longer standing. If you have a picture of one, would you please share it with us with us! PAST would love to honor it for the 100+ years it graced our streets. Many centennial homes and commercial buildings are listed on the Palo Alto Historical Buildings Inventory. If you have information about the building date of properties not included on this list, or would like to research the history of your home or make corrections, please use the link to how to research your home, or send an e-mail to PAST at webmaster@pastheritage.org. We would especially appreciate receiving information on more Stanford University homes! Be sure to read the article from The Mercury News of January 7, 2012 Living in the past: Uncovering your home's roots about a successful historical search! Centennial plaques received by owners are marked with an asterisk. If we have not indicated yours, please contact the webmaster. Many more older homes still exist in Palo Alto, but because of annexations (Mayfield, including College Terrace, Barron Park and what is now identified as South Palo Alto), the history of these homes has been lost. A highlighted address indicates a photo or text link. Photo of owners of centennial homes and preservation awards. See pictures from the plaque presentation. See photos from the plaque presentation on May 15, 2016. Photos from the 2017 presentation. See photos from the May 16 presentation. Centennial buildings as listed by street. Some houses have multiple listings because they have been identified as being constructed in more than one year. Sometimes this is due to identification by the building permit date which was issued the year before occupancy.